What is this Joan Portal you speak of? If Joan were a spaceship, the Joan Portal would be its control panel. Joan’s Portal allows you to adjust your device’s settings, turn features on/off, check the battery status and the Wi-Fi signal, but most importantly, vote to implement new features and even try out those that are already in beta testing. Not sure where to turn off that one specific setting? This post should help you find the tools you are looking for. This is where you manage (what a shocker, I know) all of your connected Joan devices, rooms, and locations, check a device’s battery status or Wi-Fi signal and adjust location specific settings. If your business is international or is divided into multiple departments with different work hours or even work languages, Joan can accommodate your needs. You can set a different logo, display language or even individual features, based on the location of the device. 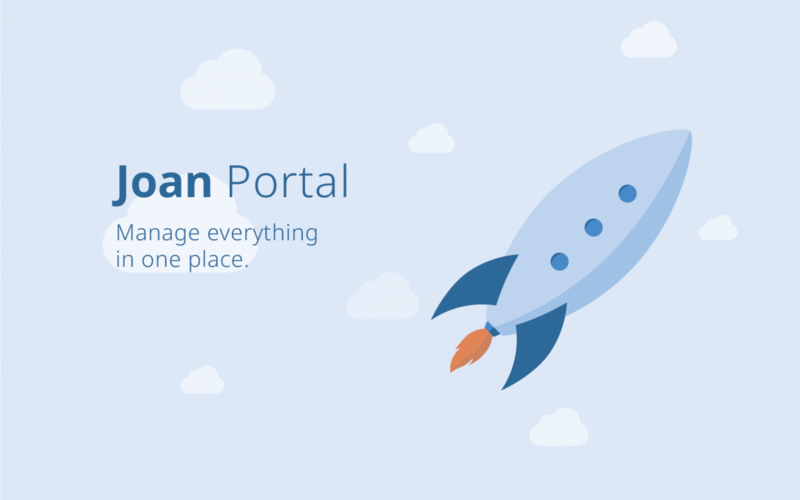 Is the Portal’s main tab that lets you edit your account information, billing details, connected calendar, global device features, integrations, and Joan’s staple Warm Welcome email. Under the device features section, you can find a multitude of options to completely customize your devices. Don’t want people to cancel meetings at the door? Turn that feature off. Is the tap sound wasting your battery? Disable it with one click. These settings are applied globally, but you can easily override them when you manage devices individually or, as mentioned before, as part of a particular location. The other very important addition to this tab is the mobile app invite button found under the “Account” section. Only the users invited in this manner can gain access to Joan’s mobile app. The most exciting part of the Joan Portal. This is our favorite tab as it reflects our core motto – working with our customers to deliver a better product. Want to try out new features before everyone else and influence what’s coming next? Sign up for Joan Labs today! As of right now, you can already beta-test Joan’s custom content, preorder Joan Parking, download our mobile app, and add Joan to your Cisco Webex Teams. Pretty cool, right? As always, keep following our social media, blog, and newsletter, to stay on top of any news, fixes and beta releases.